Chart No. 46 - Brachial Plexus and Shoulder Release in the Sitting Position for Respiratory, Digestive, Circulatory Trouble, and Shock. 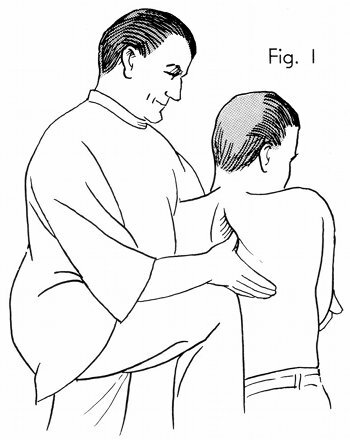 Fig.1 shows the same arm lift and knee position on the chair as in Chart No. 36. 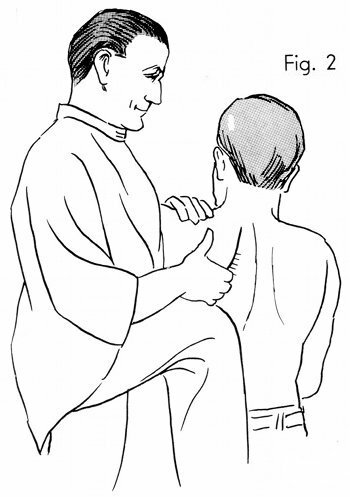 The thumb and the fingers slide under the shoulder blade as the shoulder is lifted. Both contacts are all around the shoulder blades where the tension is found. Any doctor should be equipped with a good manipulative art which can be skillfully given on an ordinary kitchen chair for the relief of many ailments and pains. 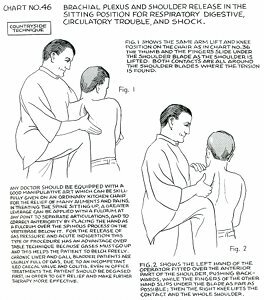 In treating the spine sitting up, a greater leverage can be applied with a fulcrum at any point to separate articulations, and to correct anteriority by placing the hand as a fulcrum over the spinous process on the vertebrae below it. For the release of gas pressure and acute indigestion this type of procedure has an advantage over table technique because gases must go up and this helps the patient to belch freely. Chronic liver and gall bladder patients are usually full of gas, due to an incompetent ileo caecal [ileocecal] valve and colitis. Even in office treatments the patient should be degased [degassed] first, in order to get relief and make further therapy more effective. Fig. 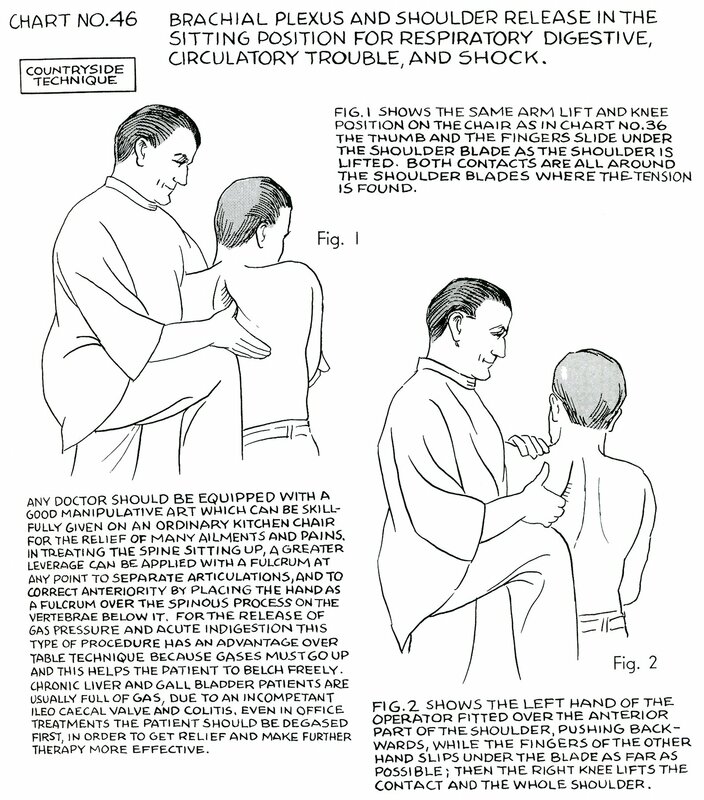 2 shows the left hand of the operator fitted over the anterior part of the shoulder, pushing backwards, while the fingers of the other hand slips under the blade as far as possible; then the right knee lifts the contact and the whole shoulder.